This week, Lay Reader Steve leads us into what really matters to God: people. People are the reason for the Earth and everything in it. People are why God sent Jesus Christ to Earth-to bring us back to a relationship with Himself that would be impossible for us to accomplish because of our sin. Join us as we find out what we can do to release the love of God to this broken world's people. 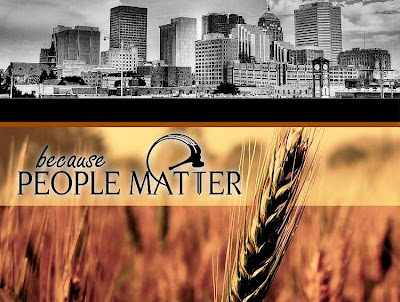 Click to listen or download: People Matter. Jesus, our Saviour, thank you for giving up everything for us and making us your people. Live within us and teach us to follow you without counting the cost. For you live and reign with the Father and the Holy Spirit, one God, now and forever. Amen. Photo credit: 'People Matter' from Akuman1's Photo Stream on Flickr. Please note: last weeks' message is unavailable due to illness. 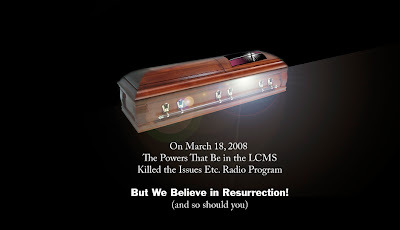 To all those who were concerned about the removal of Issues, Etc from the LCMS radio station KFUO, be of good cheer: Issues, Etc is set to return soon! You can read and hear details about this wonderful news at Pirate Christian Radio. Please support this wonderful program!! This week, Lay Reader John speaks on the subject of not only listening to the Word of God, but also obeying it. We can all hear the Word, but if we don't put it into action, our faith remains dead and can do no good. Building your eternal future on a firm foundation, as found in scripture, will ensure that we come to know the depth of love Jesus has for us and how we cannot but help passing that love on to our fellow man. Click to download or listen: Hearing and Obeying. Almighty and everliving God, increase our faith in your Son. Teach us to forget what lies behind and reach out for what is ahead and run to win the crown of eternal joy. We ask this through Jesus Christ our Lord, who live and reigns with you and the Holy Spirit, one God, now and forever. Amen. 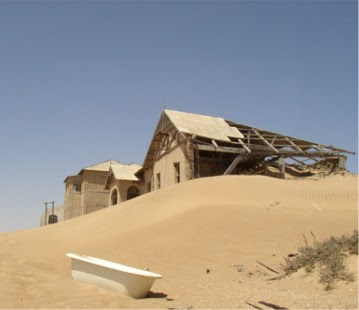 Photo Credit: 'Ghost Town 3' by Mike Vam, Cape town, W. Cape, South Africa.